Christmas that great time of year, is arriving once again. This year don’t forget about the animals in your house. Christmas can be a great time for all the family including the family pet, if we all keep a few things in mind over the holidays. When decorating your house for the Christmas season, remember that poinsettia’s, cacti, holly berry etc. are toxic to animals if eaten. Plants are best kept out of reach of curious pets. Also watch where you place candles. They can cause severe burns or star a fire if knocked over by a curious pet. If you have candles lit this holiday season, place them up high, and keep an eye on your cat to prevent singed whiskers! The Christmas tree is always a great reminder that Christmas is on its way. 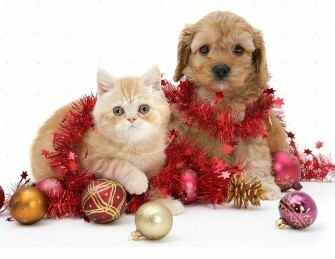 When decorating, keep in mind that animals might chew on the ornaments or tinsel. During the Christmas holidays it isn’t unusual for the vets to see animals with decorations that have become lodged in the intestine and/or cut the intestinal wall. Removal for such objects can require surgery. When the whole family sits down to Christmas dinner to enjoy a great meal, you might want to remind your guests that giving your dog turkey bones isn’t a good idea. It could get lodged and require surgical removal. Also, alcoholic beverages are not good to give to the animals. An ounce of a drink that is 20 to 40 proof can cause alcohol poisoning in a small dog. Now it’s time to get the gift- wrapping done. But of course there is a list of things to look out for there too. Ribbon, trim polystyrene foam packaging, wrapping foil and paper are dangerous if eaten by your pet. Always wrap packages in an area away from your pet. Collect and discard all the waste and any wrapping paper and supplies you are using should be put away. If you have any gifts for your dog, use plain brown paper, wrap loosely and supervise the unwrapping. We all like a bit of extra chocolate over the holidays. We need to be aware that this substance is poisonous to our family pets, (dark chocolate is the worst). Even a small amount of chocolate to a small dog can make them very ill. Make sure that gifts of chocolate under the tree are not left with an unsupervised family pet. If we keep all of these thing in mind, we all will have a safe and happy holiday season.